Brand New In Retail Box! 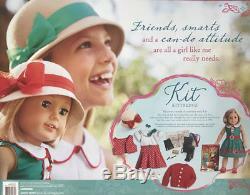 American Girl 16 pc Kit Kittredge 18 Doll Set. Condition: Brand New in Retail Box! Discover a world of creativity with Kit! This 18-inch doll has brilliant blue eyes that open and close, and a neat blond bob. Her movable head and limbs are made of smooth vinyl, and she comes in an outfit authentic to her story, set in 1934. 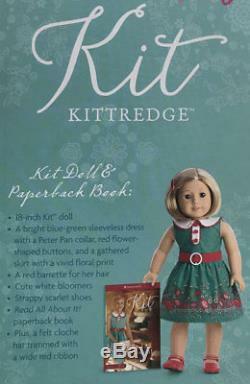 Kit Doll & Paperback Book. A bright blue-green sleeveless dress with a Peter Pan collar, red flower shaped buttons, and a gathered skirt with a vivid floral print. A red barrette for her hair. Plus, a felt cloche hat trimmed with a wide red ribbon. Kit's Reporter Dress & Vest. A pretty polka-dot dress, featuring puff sleeves, a Peter Pan collar, and a ribbon bow. An accordion-style camera that really opens and closes. A pretend box of Kodak film. A flip-top journal for taking notes. A fabric pouch to carry supplies. A bundle of mini replica 1930s Cincinnati newspapers. Your complete satisfaction is very important to us. Please note we won't be available to answer emails on weekends and holidays. 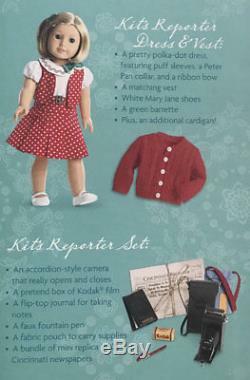 The item "NEW American Girl 16 pc Kit Kittredge 18 Doll Reporter Set Dress Book Camera" is in sale since Thursday, October 12, 2017. This item is in the category "Dolls & Bears\Dolls\By Brand, Company, Character\American Girl\Kit & Ruthie". The seller is "reliabletradingpost" and is located in Garden Grove, California. This item can be shipped to United States, Canada, United Kingdom, Denmark, Romania, Slovakia, Bulgaria, Czech republic, Finland, Hungary, Latvia, Lithuania, Malta, Estonia, Australia, Greece, Portugal, Cyprus, Slovenia, Japan, China, Sweden, South Korea, Indonesia, Taiwan, South africa, Thailand, Belgium, France, Hong Kong, Ireland, Netherlands, Poland, Spain, Italy, Germany, Austria, Russian federation, Israel, Mexico, New Zealand, Philippines, Singapore, Switzerland, Norway, Saudi arabia, Ukraine, United arab emirates, Qatar, Kuwait, Bahrain, Croatia, Malaysia, Brazil, Chile, Colombia, Costa rica, Dominican republic, Panama, Trinidad and tobago, Guatemala, El salvador, Honduras, Jamaica, Antigua and barbuda, Aruba, Belize, Dominica, Grenada, Saint kitts and nevis, Saint lucia, Montserrat, Turks and caicos islands, Barbados, Bangladesh, Bermuda, Brunei darussalam, Bolivia, Ecuador, Egypt, French guiana, Guernsey, Gibraltar, Guadeloupe, Iceland, Jersey, Jordan, Cambodia, Cayman islands, Liechtenstein, Sri lanka, Luxembourg, Monaco, Macao, Martinique, Maldives, Nicaragua, Oman, Peru, Pakistan, Paraguay, Reunion.